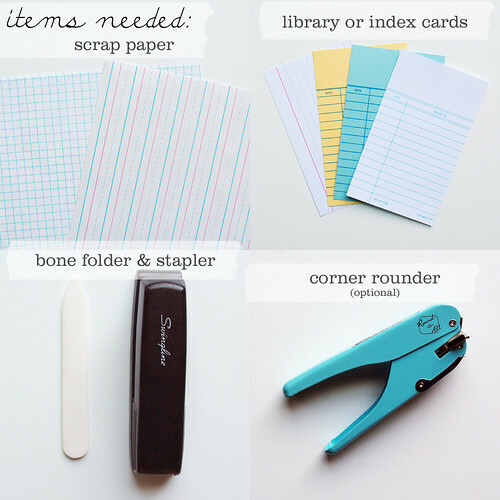 Let’s learn how to make these little notebooks! They’re perfect for jotting short notes or lists. It’s also a fun way to use up your paper scraps. 1. 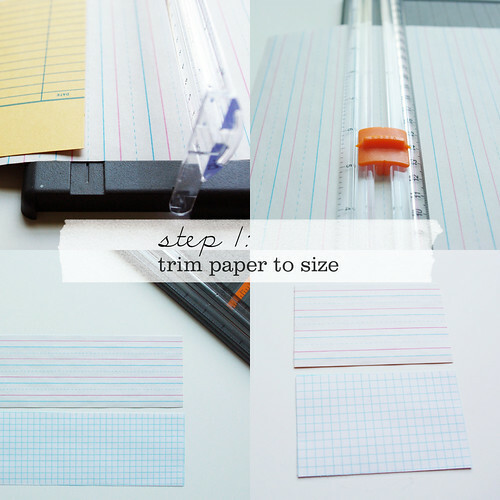 Trim your paper the same size as your card. I used a 3″ x 5″ card, with 6 sheets of scrap paper cut down to 3″ x 5″. This will give you 12 sheets/24 pages per notebook. You can also tear your paper down to size, for a different look. To do this, lay a ruler on top of your sheets and tear along the edge of the ruler. 2. Fold paper in half and crease with a bone folder. Do the same to your card. 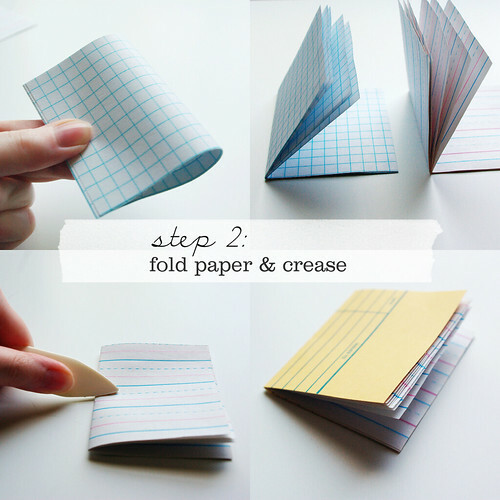 Place the folded paper inside the folded card, and crease again. 3. Make sure everything is lined up and folded nicely. 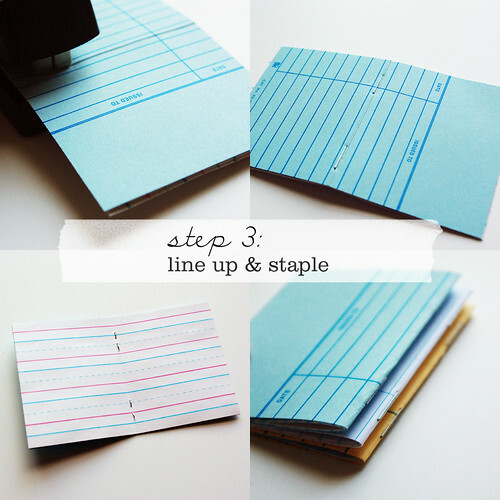 Then carefully unfold your notebook and staple once or twice along the outside folded edge. 4. Done! 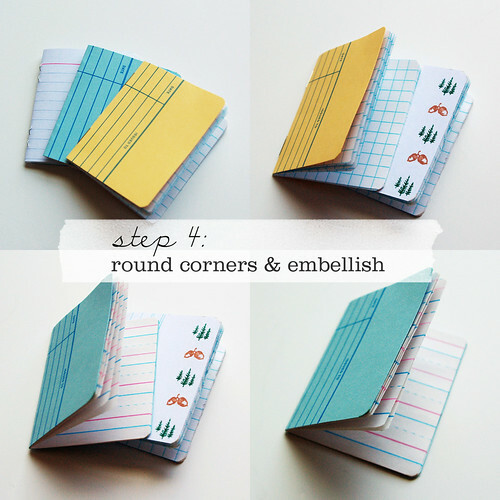 You can round the corners of your notebook for a neater look, or add some cute stamped images. If you’re looking for library cards, you can find them for sale in my shop here. Tips: To make your notebooks flatter, stick them under a pile of heavy books for a day or two. Where the heck do you get a corner rounder? I got mine here from Amazon; it’s a Zutter Round-It-All and it’s a pretty neat tool. You can’t trim a ton of paper at once like you can with a (very expensive) commercial rounder, but it handles these notebooks just fine.